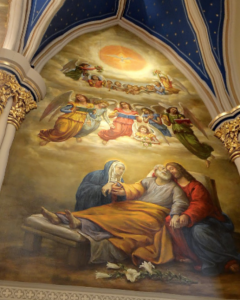 Portrait of St. Joseph, Basilica of the Sacred Heart, University of Notre Dame. After a relaxing week off from the academic schedule for spring break, we at St. Joseph House, found ourselves on the cusp of a great celebration – the solemnity of St. Joseph, the patron of the Brothers of Holy Cross. Blessed Basil Moreau, C.S.C. providently chose St. Joseph as the patron, model, and example for the Brothers of the Congregation of Holy Cross. The house celebrated with a great dinner cooked by Bro. Paul Kelly, C.S.C. on Sunday night. Since the solemnity fell on a Sunday of Lent, the Mass in honor of St. Joseph was moved to the following Monday. Our celebration continued by attending Mass at the Basilica of the Sacred Heart at the University of Notre Dame with the wider Holy Cross community in the area. After Mass, the priests, brothers and seminarians went to Moreau Seminary for a great meal and for fellowship. A special blessing was offered for the Holy Cross Brothers on their great and special feast day. Like always, this was a great celebration not only because of the festivities and fellowship, but also because it was a chance to renew our commitment to the Lord and to commend ourselves further to the intercession of St. Joseph.